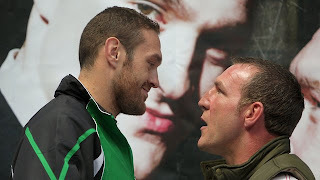 Tonight Tyson Fury and Martin Rogan will meet in the ring to decide who the number one Irish Heavyweight is. Fury was born in Manchester but members of his family are from Ireland making him eligible to fight for the Irish title. Rogan is Belfast born and bread so you would think he would be elated at the opportunity to fight for the Irish belt, but Rogan's camp have been confused at the contracts for this fight so it's not 100% that the Irish Heavyweight title will be at stake. However there is still pride and a top ten ranking with most of the major governing bodies at stake, the two Heavyweights still have a lot to fight for. Fury is the big favourite for this fight mainly due to size, youth and his undefeated record. But if Fury is as sloppy in this fight as he was when he fought Nicolai Firtha and Neven Pajkic then Rogan has a chance. Both fighters are in top condition for this fight, Fury weighs in at a career lightest this suggests that he has taken this fight seriously so I fully expect him to dominate the fight from round one up until the middle rounds where I think he will stop Rogan. But could Martin Rogan take away Tyson Fury's unbeaten record?